For years, science fiction writers from Edgar Rice Burroughs to C. S. Lewis have imagined what it would be like for humans to walk on Mars. As mankind comes closer to taking its first steps on the Red Planet, authors’ depictions of the experience have become more realistic. Andy Weir’s “The Martian” begins with a massive dust storm that strands fictional astronaut Mark Watney on Mars. In the scene, powerful wind rips an antenna out of a piece of equipment and destroys parts of the astronauts’ camp. Mars is infamous for intense dust storms, which sometimes kick up enough dust to be seen by telescopes on Earth. “Every year there are some moderately big dust storms that pop up on Mars and they cover continent-sized areas and last for weeks at a time,” said Michael Smith, a planetary scientist at NASA’s Goddard Space Flight Center in Greenbelt, Maryland. Beyond Mars’ large annual storms are massive storms that occur more rarely but are much larger and more intense. “Once every three Mars years (about 5 ½ Earth years), on average, normal storms grow into planet-encircling dust storms, and we usually call those ‘global dust storms’ to distinguish them,” Smith said. 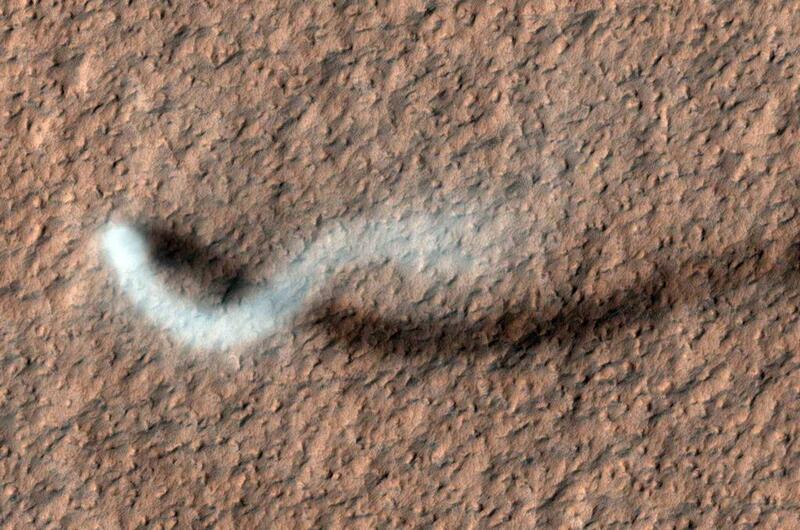 It is unlikely that even these dust storms could strand an astronaut on Mars, however. Even the wind in the largest dust storms likely could not tip or rip apart major mechanical equipment. The winds in the strongest Martian storms top out at about 60 miles per hour, less than half the speed of some hurricane-force winds on Earth. Focusing on wind speed may be a little misleading, as well. The atmosphere on Mars is about 1 percent as dense as Earth’s atmosphere. That means to fly a kite on Mars, the wind would need to blow much faster than on Earth to get the kite in the air. Mars’ dust storms aren’t totally innocuous, however. Individual dust particles on Mars are very small and slightly electrostatic, so they stick to the surfaces they contact like Styrofoam packing peanuts. “If you’ve seen pictures of Curiosity after driving, it’s just filthy,” Smith said. “The dust coats everything and it’s gritty; it gets into mechanical things that move, like gears.” The possibility of dust settling on and in machinery is a challenge for engineers designing equipment for Mars. This dust is an especially big problem for solar panels. Even dust devils of only a few feet across — which are much smaller than traditional storms — can move enough dust to cover the equipment and decrease the amount of sunlight hitting the panels. Less sunlight means less energy created. In “The Martian,” Watney spends part of everyday sweeping dust off his solar panels to ensure maximum efficiency, which could represent a real challenge faced by future astronauts on Mars. 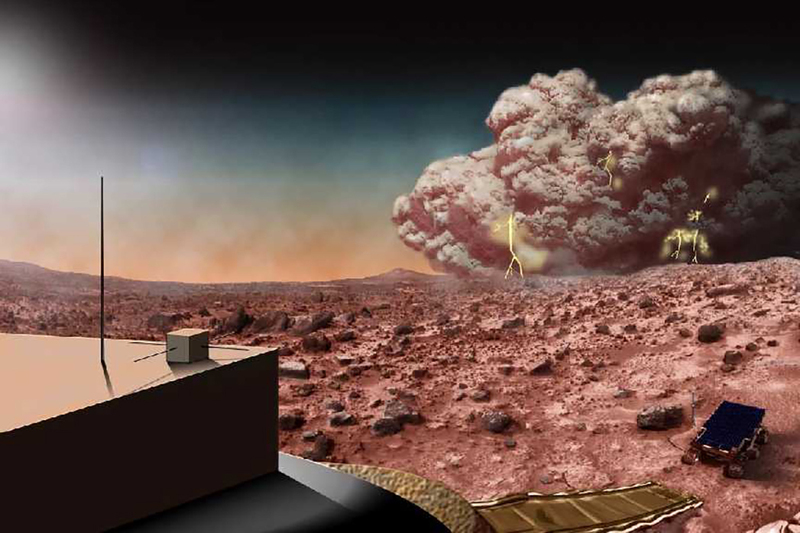 Global storms can also present a secondary issue, throwing enough dust into the atmosphere to reduce sunlight reaching the surface of Mars. When faced with a larger dust storm in the book, Watney’s first hint is the decreased efficiency of his solar panels, caused by a slight darkening of the atmosphere. That’s a pretty accurate depiction of what large dust storms can do, Smith said. Large global dust storms put enough dust in the air to completely cover the planet and block out the sun, but doing so ultimately dooms the storm itself. The radiative heat of sunlight reaching the surface of the planet is what drives these dust storms. As sunlight hits the ground, it warms the air closest to the surface, leaving the upper air cooler. As in thunderstorms on Earth, the warm and cool air together become unstable, with warm air rising up and taking dust with it. Rising plumes of warm air create everything from small dust devils, similar to those that form in deserts on Earth, to larger continent-sized storms. These larger storms sometimes combine into the global storms, which cover the entire planet in atmospheric dust. Larger storms typically only happen during summer in Mars’ southern hemisphere. Seasons on Mars are caused by the tilt of the planet, like on Earth. But Mars’ orbit is less circular than Earth’s; for part of a Martian year, the planet is closer to the sun and therefore significantly hotter. This warmer time is during the southern hemisphere’s summer, so radiative heat forces are strongest then. Once started, bigger storms can last weeks to months.